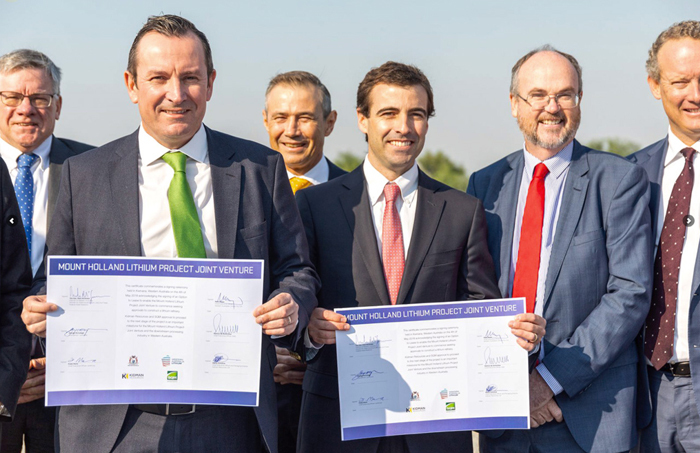 Western Australia Lithium, a 50/50 joint venture between Sociedad Química y Minera de Chile and Kidman Resources, recently signed an agreement to enter into an Option to Lease with LandCorp for the selected site. Almost 400 jobs will potentially be created during the construction of the refinery, which is expected to start in mid-2019. In addition, the company’s lithium mine and concentrator will create about 300 jobs during construction and 150 jobs during the operational phase. The refinery will produce about 40,000 tonnes per annum of lithium carbonate and/or lithium hydroxide from the mineral processed at the proposed mine and concentrator at Mt Holland, south-east of Southern Cross. Premier Mark McGowan and Mines and Petroleum Minister Bill Johnston also announced the State Budget would include provisional funding of $5.5 million to the Minerals Research Institute of Western Australia (MRIWA), to support development and manufacturing of technology metals and renewable energy sources. MRIWA will invest the funds, if successful, in its bid to establish a New Energy Industry Cooperative Research Centre (CRC) in WA with the objective of creating value, through industry-led research, and driving global demand for local products, services and solutions.